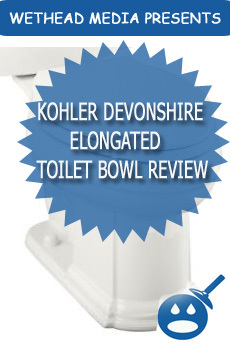 Kohler is one of the most recognized names in the plumbing fixture industry. Their company has been in business since 1873. They have everything you need and more to complete a bathroom overhaul. One of Kohler’s best features is their selection of toilets. Kohler has set an industry standard with their designs as well as their advanced technology when it comes to any of their plumbing fixtures. 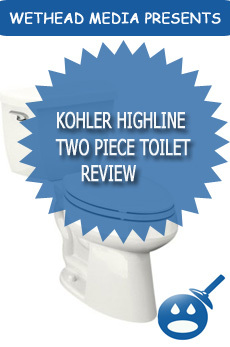 One of Kohler’s premier series for toilets is the Highline Two Piece Toilet. The Highline Series or K-3611 is called a Class Five Toilet. This toilet was designed with comfort as well as performance in mind. The Class Five Technology was created by Kohler to help keep up with the eco friendly toilet. This technology’s purpose is to help conserve water as well as deliver a high performance toilet. When you choose the Kohler Highline Two Piece Toilet you are getting a durable toilet made from Vitreous China, a material that has lasted for more than 20 years in some cases. The Highline offers an elongated bowl with the Class Five Flushing Technology. The toilet includes the tank and the bowl the seat and the supply is sold separately. The Highline offers great performance in the way of 1.6 gallons per flush or 1.28 gallons per flush. 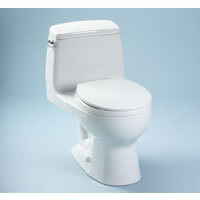 The toilet offers a 12″ rough in and a 2-1/8″ glazed trapway. 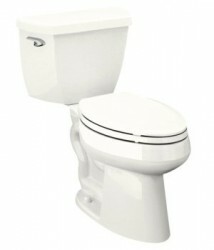 The toilet is about 17″ to 19″ depending on which model you choose from the Highline Series. The water area of the Highline Toilet is 11-1/2″ x 8-3/4″. The Highline Series offers a polished chrome trip lever and meets and exceeds all of the industry standards such as the ADA and the ASME. There are some really great colors available for the Highline Two Piece Toilet, they include White, Almond, Ice Grey, Biscuit and sleek looking Black. What sets Kohler apart from the rest of the companies is that they have a warranty that other companies follow. The company guarantees that all of their products are created without defects when they leave the factory. As an incentive to their customers, Kohler offers a one-year warranty from the date of installation. So make sure that on the date that you install the toilet that you register your product right away. You want to make sure that you read the installation manual if you are installing the toilet yourself. Find out what is covered and what isn’t. You can find a complete copy of the warranty on the company website. If you are thinking about remodeling the bathroom, consider Kohler products for all of your plumbing fixture needs. Their products and accessories are some of the best in the industry. Take a look at the complete Highline Series on the company website. You will be sure to find a style and a color that will perfectly suit your bathroom needs.